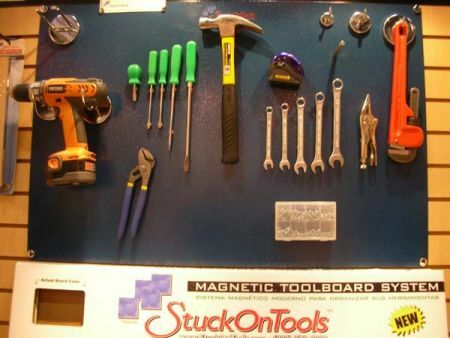 Our friends over at This Old House’s Hardware Isle blog made it out to the National Hardware Show this year — we had other obligations — and ran across some interesting pegboard solutions like the StuckOnTools magnetic board pictured above. We know how much some of you love (and hate) pegboard, so you’ll definitely want to give their post a read. I know you have a special link somewhere to submit review ideas, I’ll put this there as well. My old dad was a big advocate of pegboard. He had it in the garage and basement of the houses he owned. It looked nice and was very organized. For a long time I was sure the only reason he put it up was to bust my chops for not putting his tools away. I’ve got too many tools and too small a house to use pegboard and I like the mobility of toolchests. Chests lock too. Tools on pegboard can grow legs. Pegboards are designed so that merchandise can be quick re-organised and displayed, but tool organisation is much more static and does not require constant re-ordering. I have noticed those who go for pegboards (or the like) don’t generally do a lot of handwork and simply like to see their tools neatly displayed for all who visit. Those who do use their tools generally make their own solutions from bits of wood, angle iron, and whatever they can find to make their jobs flow easier. magnetic pegboard? sounds like either a wast of money or someone has too much time on their hands. My problem with pegboard is that the hole spacing is too coarse. If I use directly adjacent holes for things, tools collide, but if I leave a gap, the gap’s too wide and there’s a lot of wasted space. If I could get pegboard with twice the hole density, I might have better luck. The magnetic stuff looks cool, in that peg positioning is infinitely granular. I’d give it a try if it were cheap, except that it would tend to magnetize all the tools, which would end up covered in metal fuzz. I hate picking that stuff out of my hands, so I’ll do anything I can to encourage it to collect on the floor where I can vacuum it up, rather than on the tools I use. Once the tools get dirty the magnetic would have a harder time holding the tool to the board. I think Brau summed up pegboards nicely. For the garage, I prefer a solid work bench accompanied by a well organized pegboard of tools in a heart beat as opposed to expensive bulky tool chests. I find any excuse to do work around the house, therefore I’m doing it alot. I can get anything done in my garage with that set up especially with a bench grinder on one side and a vise on the other. Only careless joes with poor work ethic loose their tools. In fact, I find it way easier to see if a tool is missing with pegboard rather than not realizing anything is missing by having it all hidden away in drawers and chests. The fact that it looks nice and impresses visitors is just a bonus, not the purpose. I find practiaclity in it. I’m just defending standard pegboards from the nay sayers. As for this magnetic thing, I don’t no if I’d like it or not. Have to see it first hand.